You have to admit... as a student you would have definitely faced some level of exam stress at some point of time in your life or the other. Perhaps the degree of stress varied for each one of you, and perhaps some of you found some good ideas to deal with stress. But what remains a fact is that most of the students in the age group of 8 to 17 years feel exam stress. The problem stops not just at stress, rather, further consequences of stress as well, such as sleepless nights, fatigue, loss of appetite, and even depression and suicide in some extreme fatal cases. The number of cases where students are suffering from exam stress has increased so considerably in the past few years, so much so, that the Central Board of Secondary Education has now started running a dedicated helpline portal and phone line to help such students. Some cited the ambitious dreams of their parents and schools as the primary reason; some said that the excessive cut-throat competition and a desperation to do well than others is what leads to their being stressed out; while some said that they are just not able to grasp a particular subject no matter how hard they might try which often leads to them being stressed out. For such students who get stressed out because they are not able to grasp a subject, this is what the MapMyTalent expert Dr.GOBS has to say, "If a particular subject is not your strength then you must know what that subject is and what will be the repercussions of that subject in your long term career plan. If you have clarity about your strengths and career path, then you will not get stressed out about mastering and doing well in every subject." During exam time, it is sort of natural to get more anxious and probably feel more stressed than usual. In such a situation students must not worry as a little bit of stress is actually good in helping you stay focused and motivated. Just because it's exam time doesn't mean you should completely ban yourself from watching television. It is quite alright and important even that you keep watching your favorite TV show; but limit it to one show only during your exam time. Continue to relax - train your mind to not thinking negative thoughts. Find out your most productive hours of the day and study during those hours only. There is no point in studying for 24 hours as you won't be able to recollect anything that you would have studies. Allow yourself sufficient sleep time of 7 to 8 hours. 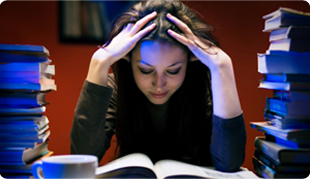 Don’t cram all night - allow time to study. Limit caffeine, tea or any other beverage - these may give you a short lift but will cause you to feel tired and cranky soon after. However, drink sufficient quantity of water as it will help your brain to function more actively. All in all, “enjoy” the exam period as it will not last forever. Remember that exams are there for a limited time frame only and you will look back and laugh at the wonderful memories you will create of your struggle during the exams.